Published by Daniel Lewis on June 20, 2015. Ever since reigning NFL rushing champion DeMarco Murray left the Dallas Cowboys to sign a 5-year, $42 million contract and join the Philadelphia Eagles, many analysts--and even players--in Dallas have chalked up his league-leading 1,845 yards to simply playing behind an elite offensive line. Murray, for his part, laughs off the suggestion that his gaudy numbers were mainly the product of running behind three Pro Bowl linemen in tackle Tyron Smith, center Travis Frederick, and guard Zack Martin. Because the media’s storyline throughout the 2014 season was that Cowboys laid claim to the best offensive line in the NFL, many pundits expect Murray’s performance to dip significantly in Philadelphia. In reality, though, Murray actually upgraded the men blocking for him by departing for Philadelphia. “They’re the Cowboys,” Peters continued. “Everything they do is pumped up. It’s America’s Team. Everything they do is overemphasized. When Shady [LeSean McCoy] was the leading rusher, they weren't saying we were the best offensive line. Don't get me wrong, they're a good, solid offensive line. But guy for guy, they can't touch us." But beyond all the glamor of "America’s team," the numbers, as always, tell the true story. And ProFootballFocus (PFF), the most widely cited statistical source in NFL media reports, agrees with Peters’ assessment. The analysts at PFF watch each play, grading each player on a scale of +2.0 to -2.0. PFF analyzed the tape and found that the Eagles lay claim to the No. 1 run blocking offensive line, despite several injuries up front that disrupted any continuity. Granted, Dallas also graded well, coming in second with an impressive 55.7 points, more than a dozen better than the third-ranked San Francisco 49ers. But the gap between first- and second-ranked offensive lines was hardly close; the Eagles tallied a whopping 85.7 points. Only four teams in the league had 30 points total for the entire year, yet the Eagles had 30 more than the next best team. While the Eagles did recently release Mathis in a longstanding contract dispute, whether or not Peters reads PFF, their numbers certainly support his claims. Cowboys fans might point to another website named Football Outsiders (FO), which ranked the Eagles a lowly 29th compared to the Cowboys’ 1st place finish in the website's offensive line rankings. In other words, they rate the offensive line entirely on the success of the running back, while also penalizing the line heavily for losses and minimizing their credit in freeing up longer runs. This formula criminally shortchanges the Eagles’ offensive line, punishing them in the rankings because of running back LeSean McCoy. Because McCoy runs so evasively, he often earns negative yardage. In 2013 and 2014, he led the NFL in runs of zero or fewer yards with 125. He also gained nearly half his yardage (619 yards) last year on runs of 10 yards or more. In other words, Football Outsiders uses a significantly flawed method of ranking the run-blocking ability of offensive lines by emphasizing the play of the running back. The weakness of the Eagles front line in their statistics was specific to McCoy, who unsurprisingly graded poorly in both PFF’s (55th) and FO’s (24th) rankings. This flawed ranking system, though, should work in the Eagles’ favors in terms of FO's rankings next year as the trot out two downhill runners in Murray and Ryan Mathews. 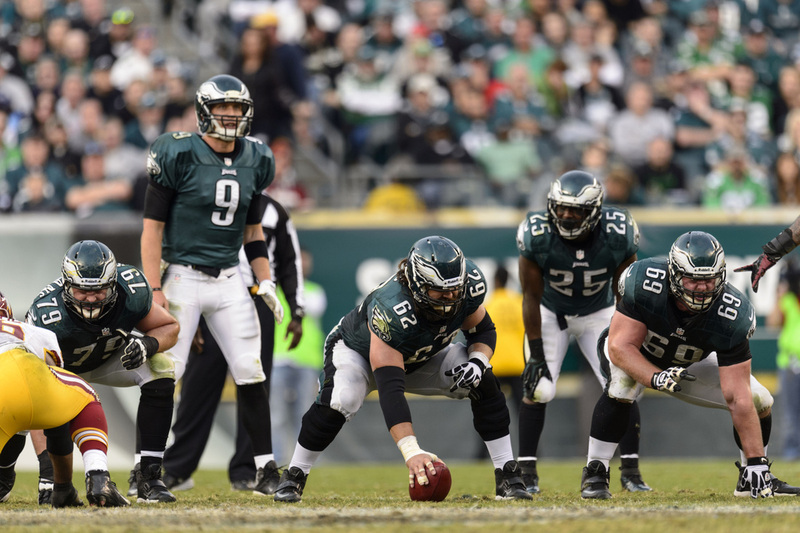 Then finally, maybe the Eagles’ offensive line will finally get the credit it deserves.